There are so many variables of the cause of this problem, but sometime it could be due A\V conflicting in start-up. Actually manually deleting user accounts under C:\Users\ or through CMD prompt could cause this issue. When removing an account manually, this will not delete the SID key which could cause conflicting when the OS is trying to load the ProfileImagePath. Also issue could be pointed to the user account which untimely will need to recreate new one and migrate results to the new user account. 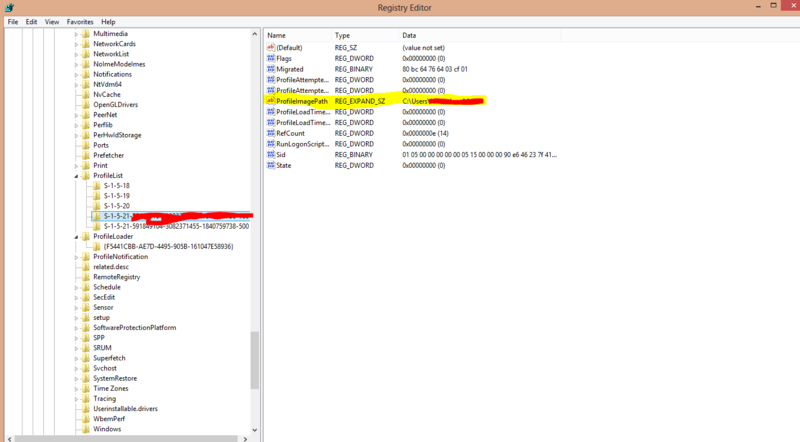 within the Windows Registry. You should see a key starting with something like this S-1-5-21. Once that is done,the SID key without the extension click on it, on the right hand side, double-click on RefCount -> make sure the value is set to 0, and double-click State make sure value set to 0 (Zero). Once the correct SID key is edit, your issue should be resolved. If this does not resolve your issue. I would suggest creating new user account and using Windows Easy Transfer for transferring your data. To whom who don’t have two of the same SID keys from step 6, please go to the resource link.